This can be difficult to do on your own, but most people fall into either warm or cool tones. “One way to figure out your tone is after washing your face to remove all impurities, preferably in a well lit room with natural light, hold a yellow and red piece of paper and then a white, green, silver and blue piece of paper against your face,” says Miguel Angarita, senior colorist at mizu new york salon. Do this separately, not at the same time! If your skin looks more flattering with yellow/red paper test, then you’re mostly in the warm family. If your skin looks best with the green/blue/ silver/white paper test, you’re mostly in the cool toned family. Another trick is to hold your wrists out and facing up under direct sunlight. If the blood vessels seem to be greenish in color, then you are a warm tone. If they appear to have a bluish tint, then you are a cool skin tone! The Truth Behind the Maintenance “The trick is to look at the undertones of your skin, and not to forget that this can change year round with or without a sun tan,” says Amy Michleb, National Director for Elizabeth Arden Red Door Spa‘s Hair Department. Olive skin has green undertones, which are best complimented by red shades. This doesn’t need to be a bold red; a strawberry blonde or an auburn brunette will work too! Someone who has red undertones will suit cooler hair shades best; violet reds, cool icy blondes and mocha browns. Darker skin tones should stay away from medium browns and dark blondes as they do not create enough contrast between the skin and hair — either go darker or lighter. Eyes also play a big part, says Michleb. Blue eyes pop with copper tones placed around the face. Hazel eyes can be made to shine by choosing the perfect shade that compliments their undertones. Look best with warm hair colors like orangish reds, golden blondes, rich honey almond browns, and chocolate brunette. Examples are Jennifer Lopez, Jessica Simpson, Halle Berry and Kim Kardashian. “If your skin tones are warm, then cooler hair colors are your best bet!” says Angarita. These include ash browns, beige, champagne blond, dark reds such as auburn and violet and dark cool brunettes. Kate Middleton, Miley Cyrus, Sophia Vergara, and Jennifer Aniston are all great examples. The best way to get an accurate answer is to go to a department store cosmetic counter and ask them for your skin tone. The best place on the body to see the truest example is behind the ear (which might be easier for someone else to see). Blondes are going from warm golds and suntanned skin to iced out, almost silvery hues against pretty pale complexions; Julianne Hough is a perfect example. “She recently went from a warmer honey color to a bold, cool silver blonde that makes both her cool skin tone and cool blue eyes pop!” says Nick Penna Jr. of SalonCapri. Brunettes who were once warm with caramel or golden dimensional highlights are moving towards cool chestnuts with icy brown-toned highlights. Right now, Penna is loving Carrie Mulligan’s hair. It’s a great example an icy-toned brunette that works perfectly to compliment a very pale pallor. Brunettes with an olive skin tone should steal clear of hair colors that match their skin tone and stick with a cool espresso tint that adds contrast to their darker complexion. Penna loves the contrast of Adriana Lima’s cool ebony colored hair and warm olive skin tone. Redheads are moving away from the stark, bold reds (Christina Hendricks) and shifting to the softer and significantly warmer, rose gold color. “This color enhances the everyday strawberry blonde, creating a rich deeper hue with dimension. 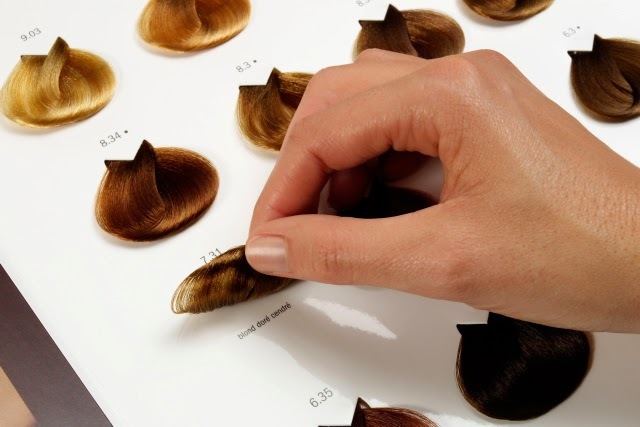 We’re seeing this color everywhere, from watches to handbags, and now, hair!” says Penna. Natural redheads are have a pink toned pale pallor by nature and this should be kept in mind when dying your hair this hue as could clash with darker, olive-hued skin tones. Blake Lively’s red hair for her role in Green Lantern was a warm copper tone that matched and blended to her bronzed, tanned skin — not a great choice, says Michleb. If she wanted to stick with red, a better choice for her skin tone would have been a cooler red tone with a little more violet in the mix! Rachel McAdams wears a similar shade, but it suits her perfectly and gives her a Hollywood chic look. Sombre. The ombré technique is a thing of the past, now it’s about the ‘Sombré’ technique, says Penna. Penna says this technique is so universal and can be used on both warm and cool skin tones; it makes for the most natural looking and effortless color that that has been gracing the heads of celebrities such as Lauren Conrad who has a warm yellow orange California sun complexion, to Brazilian model and celebrity Gisele Bundchen, who fluctuates from a cooler toned tan to a more pale hue. ©2013 Geekish Theme. Share on Blogger Template Free Download.